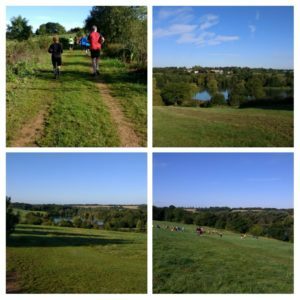 A couple of months ago, Westmill parkrun began in Hertfordshire (around the time I went to South Oxhey for my then penultimate Herts parkrun)- it is only a few miles beyond Panshanger (on the outskirts of Ware) but due to holidays and celebrating Dad’s 100th we just hadn’t had a weekend to visit there until this week. The plan was for a visit there and then back to mine for breakfast after. As Dad would have to drive past me to get there, him and Mum picked me up at 8.15 and as it is fairly close we were sat in the car park at 8.30. The parkrun takes place in a sort of outdoor activity centre, with a go-ape style climbing section, a golf course and apparently axe-throwing (although I didn’t notice that). We parked in the first car park and then found someone in a high viz vest who directed us down a gravel track to where the parkrun finished- there was an additional car park here (and to be fair the directions on the website did mention a gravel track but as we also drove down one from the road we thought we were already there)- it was only a 5 min walk and as it was such beautiful weather it was fantastic to enjoy the views across the valley and down to the lakes. Mum was going to watch (and basically chat to anyone around, especially anyone with a dog) while we ran, and was very handy as she also carried our jackets once we started as it was a bit nippy- it definitely felt more autumnal. The first timers briefing was fairly busy- this was only its 8th event so as well as tourists there were lots of local runners who hadn’t run it before. We could see it would be a little hilly as we could see markers down in the valley and the finish funnel half way up a steepish hill. 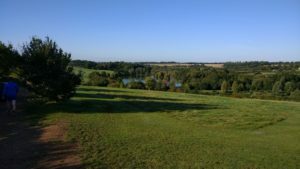 It was described as “flat with added gravity”- the RD had seen my Ellenbrook top and commented that it is very flat there, but I reassured her that we used to run at Panshanger before that started so we are OK with hills. Once the briefing was completed, we walked up the track (back towards where we had parked) as the start was a little further up. They mentioned to us that there was a waffle house cafe as a place to get a hot drink and breakfast once you finished so we thought we’d have a look at the end. The route was nearly two laps- you started half way up a hill, ran to the top, across fields and a golf course, then down (including some very steep downhills where we were all warned as last week someone had fallen into a bush at the bottom) to the lakes, around the lakes before a steep uphill to the finish area, then you continued up the hill (next to the track we walked along to the start) before repeating the loop again. I ran with Dad for the first loop and then he decided to push on for a quicker second lap so he sped off and I took a few photos while I was running. It was such a gorgeous setting for a parkrun- the course didn’t feel that long (in fact I got to the lakes for the second time and wondered when my watch would beep for 2 miles, and when I glanced at my watch it was on 2.6 miles)- it was fairly twisty and really varied so it kept your interest on the scenery. At one point we ran down a shaded track and the drop in temperature was really noticeable. The short steep uphill was tough for the first time around- much like the old short and sharp finish at Panshanger- and I wasn’t particularly looking forward to it the second time around! As I ran into the field I could see Dad up ahead just finishing, so I made sure I pumped my arms on the hill and put in a bit of a sprint finish on the flatter section to the finish funnel as he cheered me through. He finished in position 32 with 27.03, and I was position 48 with 29.30 (and second in my age category). Only 78 people ran so it’s a fairly small one still, which adds to the community feel. As we walked back to the car we had a look inside the cafe at the menu, and have decided that in the spring we will come back and aim for breakfast there. 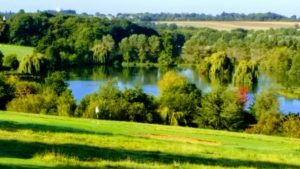 (I’m sure I’ll head there at other times too as it was such a pretty place to run- I love the parks that feel more like countryside than a city centre park or cricket pitch). We then drove home and enjoyed watermelon (loving this after a run), croissants and tea (or coffee for my parents). Now, the important thing is how am I getting on with the Herts parkruns? Well, as of this weekend I only have one left to do (Cassiobury in Watford still), but there is a parkrun currently in Hatfield Forest (Essex) which is relocating to Bishops Stortford (Herts)- so in October I’ll be back to having two left to do! There’s worse problems to have I suppose! Are you chasing any parkrun sets? What type of places do you like to run in? Do you mind hills or laps? Well done! I think I’ve done 15 parkruns at 6 different locations now. I did one while we were away camping at Pegwell Bay in Kent last month, it was nice and flat on gravel paths. That sounds like a good one- it’s so fab that you can fit one in while you are away somewhere. Nice work on getting more tourism in! Sounds like a lovely parkrun. Love the description about the added gravity! I’m planning on getting in more tourism in the coming months as I’ve decided not to do as much start up volunteering as I really don’t enjoy it during the winter. It makes me really hate going as I get so cold before running. Maybe selfish but I’ve done a lot of volunteering in my time! Thanks! We are squeezing some in before it gets colder (and before Dad goes on his cycling trip). I don’t think that is selfish- lots of people don’t volunteer at all (which is fine). I prefer marshaling in the summer as it’s too hot to run and if you marshal in the winter you get freezing. But lots of people prefer it the other way around as they can wrap up warm while stood about. This setting looks so beautiful! It was- I will be back for sure! 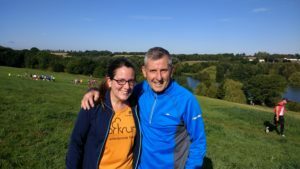 I’d have never known about it if it wasn’t for parkrun.